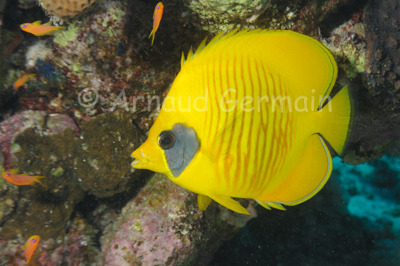 This fish is an icon of the Red Sea as it endemic to the region. It is also quite common. Although I have seen schools of them near Safaga in the past, I have only seen pairs near Marsa Shagra. This one was under a table of Acropora coral and as I was with a fellow photographer, who was also interested in small stuff, I managed to spend about 10 minutes with this pair. I took about 30 pictures and got this one when the fish “puffed up” as it extended its mouth. Nikon D700, Nikon 28-105 mm macro at 105mm, F8, 1/60th, ISO 400, Ikelite Housing and Ikelite DS160 strobe set on TTL +0.3 EV. Marsa Shagra South House Reef at about 18 metres, Marsa Alam, Egypt.